To give back to the wider community, here are all my course notes for the 70-534 Architecting Microsoft Azure Solutions certification exam. If you read through all of these bullet points and diagrams and understand the lot, you will know enough to pass the exam. to prove that, this is everything I learnt to pass the exam myself, late July 2017. Use the new portal wherever you can. Starting limit of 50 VNETS per subscription, can be upped to 500 upon request (for ARM). IP address are dynamic by default, you can set static IP’s. The lowest level at which a network security group is restricted is the region, i.e. all resources in an NSG must be in the same region. Endpoint-based ACL’s provides the ability to selectively permit or deny traffic for a virtual machine endpoint. ACL’s only work on VM public port endpoints. You can’t have both an NSG and an endpoint ACL applied to the same VM. Microsoft says It is recommended to use Network Security Groups (NSGs) instead of ACLs whenever possible. To force traffic via a route, e.g. 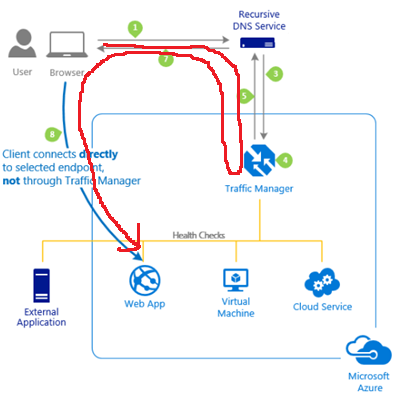 stop web traffic from an Azure VM going straight to the internet, but go via an express route to your datacentre then out to the internet. In this example, you would create a new ‘Route table’ and add a route like this. 0.0.0.0/0 is the ‘default route’. All packets for destinations not established in the routing table are sent via the default route. Another reason to use Route table and IP forwarding, would be if you deploy a marketplace firewall virtual appliance (instead of using NSG’s), then you will need to create a route to make all traffic go to via that virtual firewall. The two VNETS are still managed as separate resources, but VM’s in the peered virtual networks can communicate with each other directly by using private IP addresses. The peered virtual networks must have non-overlapping IP address spaces. No transitive relationship across peerings. For example, if VNET A is peered with VNET B, and VNET B is peered with VNET C, VNET A is not peered to VNET C.
You can peer virtual networks that exist in two different subscriptions as long a privileged user of both subscriptions authorises the peering and the subscriptions are associated to the same Active Directory tenant. Cost: Ingress and egress traffic is charged at both ends of the peered networks. If you want to connect two VNET’s in different regions use a VNET-to-VNET VPN. Resource Groups allow you to operate on groups of VM’s at once. 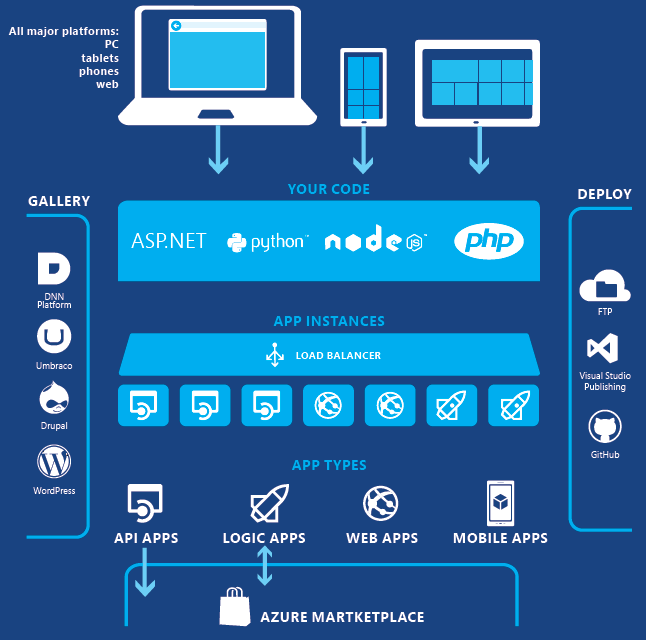 API apps in Azure App Service offer features that make it easier to develop and host APIs in the cloud. API Management is about managing APIs. You put an API Management front end on an API to monitor and throttle usage, manipulate input and output, consolidate several APIs into one endpoint, and so forth. The API’s being managed can be hosted anywhere. API Apps is about hosting APIs. The service includes features that facilitate developing and consuming APIs, but it doesn’t do the kind of monitoring, throttling, manipulating, or consolidating that API Management does. 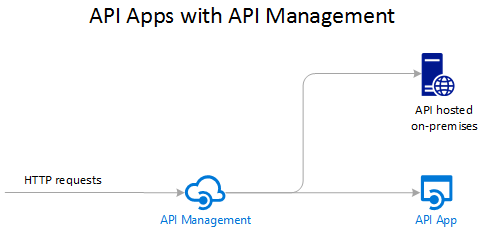 If you don’t need API Management features, you can host APIs in API apps without using API Management. Web Deploy, built into Visual Studio .NET, Web Deploy differs from Kudu in that application binaries are built before they are deployed to Azure. Application templates – Choose from an extensive list of application templates in the Azure Marketplace that let you use a wizard to install popular open-source software such as WordPress, Joomla, and Drupal. Visual Studio integration – Dedicated tools in Visual Studio streamline the work of creating, deploying, and debugging. Site extensions feature allows developers to essentially write “apps” that can be run on an Azure WebApp to add administrative functionality to it. These extensions can also be published to the Site Extensions Gallery, which allows others to install and use the extension as well. WebJobs– On a Web App, run code as background tasks on demand, continuously, or on a schedule (either Azure Scheduler or CRON). To stop a web job from being hibernated, enable the ‘AlwaysOn’ setting. All App Services run under a shared App Service plan. An App Service plan represents the collection of physical resources used to host your apps. 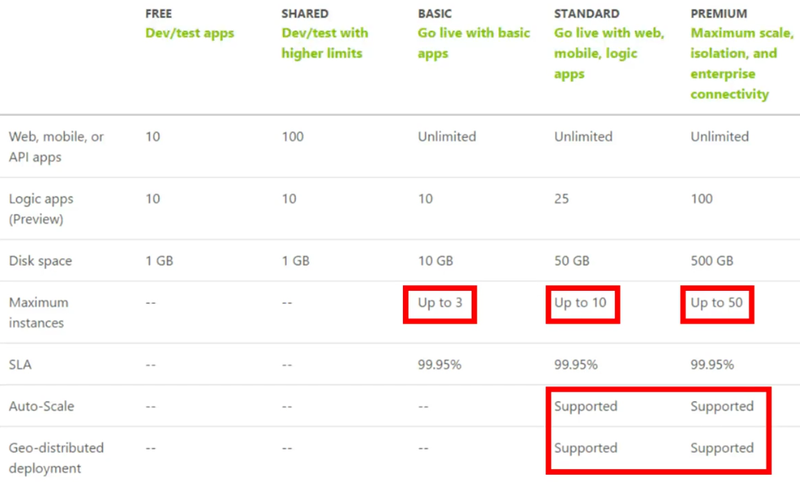 This sharing saves money when hosting multiple apps in a single App Service plan. Both apps and plans are contained in a resource group. A resource group serves as the lifecycle boundary for every resource that’s within it. Standard and Premium tiers have Automated Backups. If you build stateless apps though you shouldn’t need backups as all data should be stored off the actual App servers. You can scale up your tier to get more CPU, memory, disk space, and extra features like dedicated virtual machines (VMs), custom domains and certificates, staging slots, auto-scaling, and more. This benefits all the Apps running in your App Service Plan. You can scale out your instances to increase the number of VM instances that run your apps in the Basic, Standard and Premium tiers. Auto-scaling to increase how many instances can be done in Standard and Premium plans, choose a metric and the app can scale based on that. Before deploying a new or updated app to production, you can stage it. Doesn’t copy any files, Azure just swaps the Virtual IP addresses of the source and destination slots, thereby swapping the URLs of the slots. Each deployment slot is like a full-fledged App Service instance. The staging slot before flipping over can be ‘warmed up’, Azure does this by firing a couple requests into the root of the slot. This is a classic ASM service and new deployments should use the ARM App Service instead. 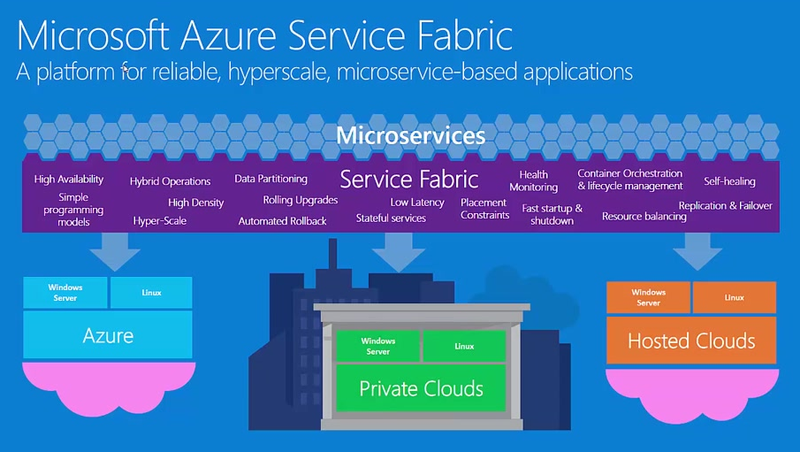 Azure Service Fabric is a distributed systems platform that makes it easy to package, deploy, and manage scalable and reliable microservices. You can scale different parts of your application depending on the needs of the application. Development teams can be more agile as they roll out changes and thus provide features to customers faster and more frequently. 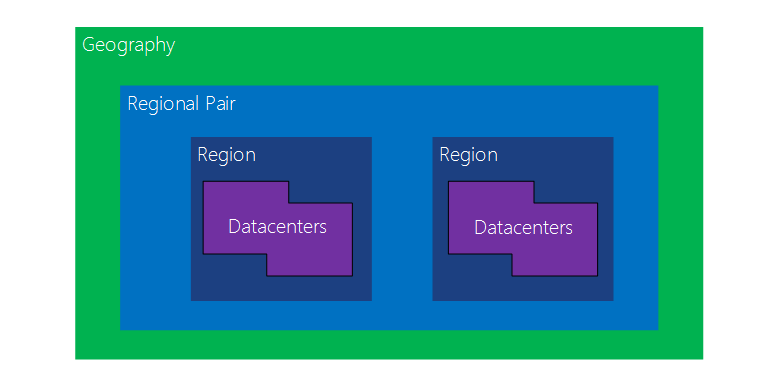 You can create clusters for Service Fabric in many environments, including Azure or on premises, on Windows Server, or on Linux. To use Service Fabric (which are microservices), you need to design your application completely differently. Break your monolithic app into microservices e.g. a login authentication service, a service that processes PDF’s, a service that handles user profile changes. 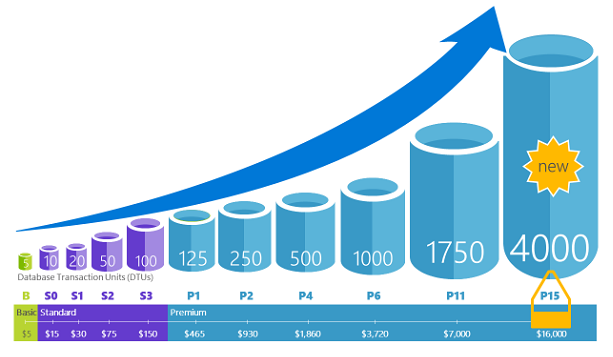 Maximum VM’s per Azure subscription is 10,000 per Region. D, Dv2, DS, DSv2, A came first then DS with newer chipset Balanced CPU-to-memory ratio. Ideal for testing and development, small to medium databases, and low to medium traffic web servers. Compute optimized F, FS F for Fast High CPU-to-memory ratio. Good for medium traffic web servers, network appliances, batch processes, and application servers. Memory optimized G, GS, DS, DSv2 Great for databases as high memory High memory-to-core ratio. Great for relational database servers, medium to large caches, and in-memory analytics. Storage optimized LS Loadsa Storage High disk throughput and IO. Ideal for Big Data, SQL, and NoSQL databases. GPU NV, NC Think N for Nvidia (Graphics) Specialized virtual machines targeted for heavy graphic rendering and video editing. Available with single or multiple GPUs. High performance compute H, A8-11 High performance Our fastest and most powerful CPU virtual machines with optional high-throughput network interfaces (RDMA). Single VM instance if all disks use Premium Storage gives Azure guaranteed uptime SLA of 99.9%. Which is 44min a month downtime. 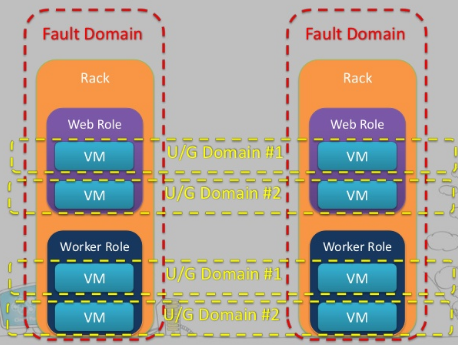 Fault Domains (FD) is essentially a rack of servers. It consumes subsystems like network, power, cooling etc. So 2 VMs in the same availability set means Azure will provision them in to 2 different racks. The maximum number of fault domains varies by region, but it is between 2 and 3. Update Domains (UD) are when Microsoft must patch the underlying Hosts. Default is 5 update domains and maximum is 20. Availability sets – Two or more identical VM’s running under a load balancer, such that if one fails, the others can pick up the load. Assigning VM’s to an availability set will spread them across Fault domains and Update domains automatically to ensure minimum accidental or required downtime. Availability sets gives an Azure guaranteed uptime SLA of 99.95%. Which is 22min a month downtime. Use Managed disks for VM’s in an availability set, as it automatically places the disks in different storage clusters providing better reliability. 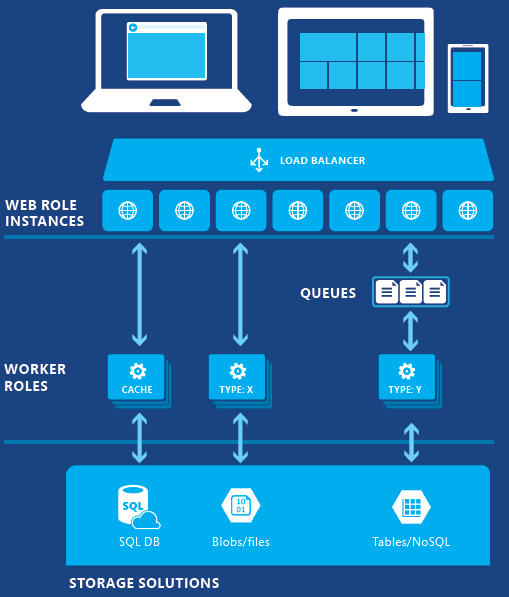 Azure Load Balancers, and Application Gateway integrate seamlessly with scale sets. You can perform management operations on both scale sets and individual VMs within a scale set. The Azure portal provides a customisable resource usage graph. A scale set supports up to 1,000 VMs. The limit is 100, If you create and upload your own custom VM images. If 0-100 size scale sets are created, all VM’s go in 1 placement group, for each additional 100 VM’s they go in placement groups, with its own fault domains and upgrade domains. Higher level Azure services such as Batch, Container Service, and Service Fabric also use scale sets as their underlying infrastructure in order to simplify large scale deployments and make it easier to deploy cloud scale architectures. You can also write ARM templates in Visual Studio and deploy straight to Azure. Azure PowerShell provides a set of cmdlets that use the Azure Resource Manager (ARM) model for managing your Azure resources. Even has some options that are not available in the portal. Also available is the Azure CLI, now in 2.0 version which has ARM support. It is available for Windows, Linux and Mac, it is not as good for scripting multiple actions, but is great for developers that prefer other OS’s. 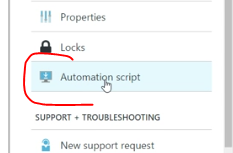 Microsoft Azure Automation provides a way for users to automate the manual, long-running, error-prone, and frequently repeated tasks that are commonly performed in a cloud and enterprise environment. Using ‘Hybrid Runbook Worker’, runbooks can run in your local data centre to manage local resources. VPN client your end using SSTP (Secure Socket Tunnelling Protocol) which does not require physical hardware VPN device, and VPN gateway the other end. Private fibre connection to Azure from your datacentre or your co-location facility, doesn’t travel over the public internet. Load Balancer – Transport layer TCP, UDP (Layer 4). It provides network-level distribution of traffic across instances of an application running in the same Azure data centre. 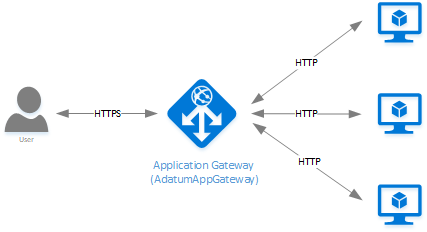 Application Gateway – Application layer (Layer 7). provides application delivery controller (ADC) as a service, offering various Layer 7 load-balancing capabilities for your application. Traffic Manager – DNS level (DNS is an application so is layer 7). Provides global DNS load balancing. It looks at incoming DNS requests and responds with a healthy endpoint, clients then connect to those endpoints directly. Guest agent probe (on Platform as a Service Virtual Machines only): The load balancer utilises the guest agent inside the VM. The guest agent listens and responds with an HTTP 200 OK response only when the instance is in the ready state. HTTP custom probe: The load balancer will regularly probe your endpoint (every 15 seconds, by default). The instance is considered to be healthy if it responds with a TCP ACK or HTTP 200 within the timeout period (default of 31 seconds). TCP custom probe: This probe relies on successful TCP session establishment to a defined probe port. Application Gateway can be configured as an Internet-facing gateway, an internal-only gateway, or a combination of both. Protocol. Choose HTTP or HTTPS. It’s important to note that HTTPS monitoring does not verify whether your SSL certificate is valid–it only checks that the certificate is present. Port. Choose the port used for the request. Path. Give the relative path and the name of the webpage or file that the monitoring accesses. A forward slash (/) is a valid entry for the relative path. This value implies that the file is in the root directory (default). Priority: when you want to use a primary service endpoint for all traffic, and provide backups in case the primary or the backup endpoints are unavailable. Weighted: when you want to distribute traffic across a set of endpoints, either evenly or according to weights, which you define. The weight is an integer from 1 to 1000. This parameter is optional. If omitted, Traffic Managers uses a default weight of ‘1’. Using a higher weight means more frequent traffic. Performance: when you have endpoints in different geographic locations and you want end users to use the “closest” endpoint in terms of the lowest network latency. 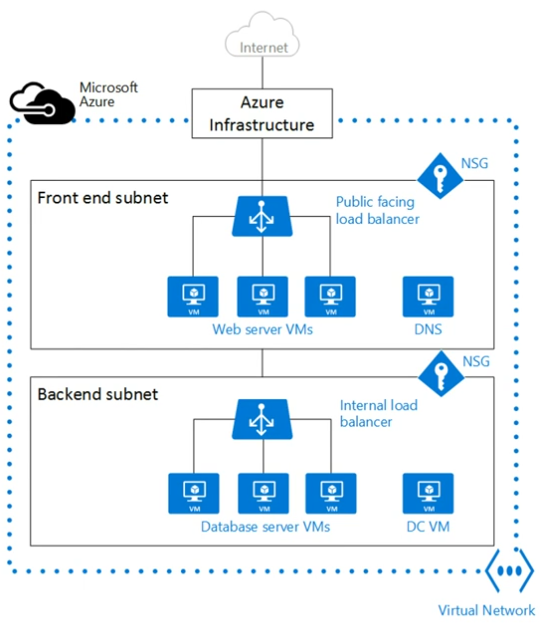 Geographic: users are directed to specific endpoints (Azure, External or Nested) based on which geographic location their DNS query originates from. Examples include complying with data sovereignty mandates, localisation of content & user experience and measuring traffic from different regions. 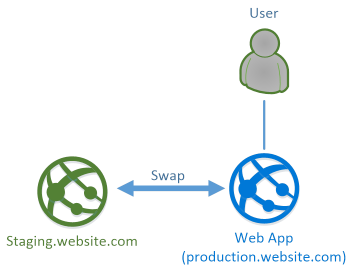 ‘Nested profiles’ are possible to combine two different load balancing methods. For example, you can have the Geographic routing method be top level, and then Priority routing method below that. Media Ingest, encoding, format conversion, content protection, media analytics, and both on-demand and live streaming capabilities using an integrated content delivery network. Build end to end workflows. Azure AD does not have all the above features AD has. Azure AD Domain Services – is a managed domain service providing domain join, group policy, LDAP, Kerberos/NTLM authentication that is fully compatible with Windows Servers/clients. The whole point of AAD DS is that it removes the need for you to build and manage your own domain controllers on the cloud. 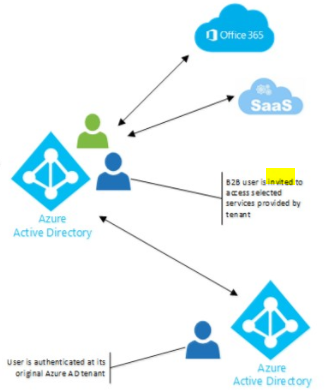 Azure AD Connect – will integrate your on-premises directories with Azure Active Directory. This allows you to provide a common identity for your users for Office 365, Azure, and SaaS applications integrated with Azure AD. AADSync and DirSync are older methods and aren’t supported after April 2017. A trusted client would be a server where there is no way a user can see the back-end source code or modify it. The application requests a token from an identity provider, they do not ever see your password or need to know it. OpenID was created for federated authentication, that is, letting a third-party authenticate your users for you, by using accounts they already have. Azure Active Directory (Azure AD) supports for Single Sign-On via SAML (Security Assertion Markup Language). SAML claims are a way an identity is verified when you don’t have a trust, and usually over the internet you don’t. SAML works on a token system. A user authenticates with one system, and that system gives them a token. The user then presents that token to another system, and after that system verifies the token is valid, it accepts the user as authenticated. If the use case is to develop SSO where at least one partner is enterprise use SAML, otherwise use OpenID. If the use case involves mobile devices for API authorization then use OAuth. 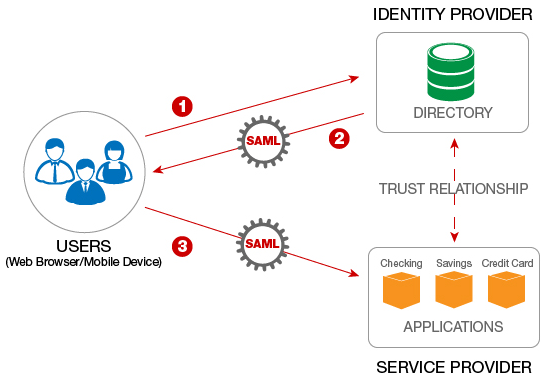 If use case requires a centralised identity provider the use SAML. Federation with Azure AD enables users to authenticate using on-premises credentials and access 3rd party applications often SaaS apps via single sign-on. 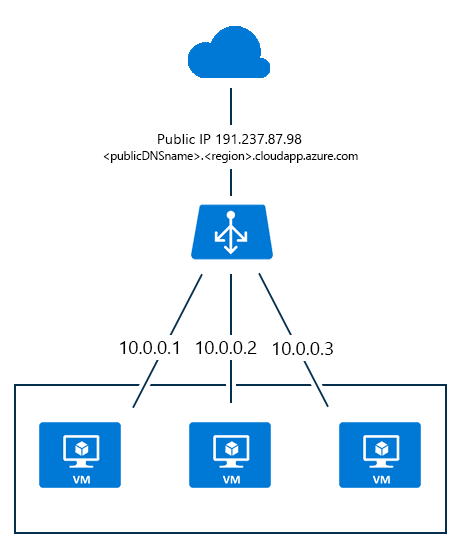 AD FS can be installed on on-prem servers/VM’s or on Azure VM’s. ADFS aims to reduce the complexity around password management and guest account provisioning, and it has taken on additional importance as organisations and employees rely more on Software as a Service (SaaS) and Web applications. Once a user logs in with his or her Windows credentials, AD Federation Services authenticates access to all approved third-party systems. Azure AD B2B (Business to Business) lets you enable access to your corporate applications from partner-managed identities. You can create cross-company relationships by inviting and authorising users from partner companies to access your resources. Azure B2B supports most of the federation features of ADFS, so can be used to replace ADFS running on Windows servers on-prem or on Azure VM’s. Azure AD B2B allows you to authenticate corporate users from other companies. Azure AD B2C is not targeted at other organisation users but consumers so B2C and B2B complement each other. 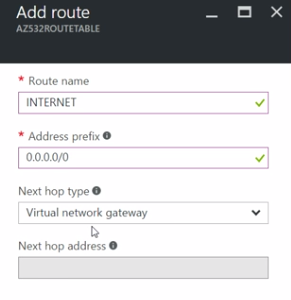 Azure AD Application Proxy helps you support remote workers by publishing on-premises web applications or applications hosted behind a Remote Desktop Gateway so they can be accessed over the internet. This means you don’t need a VPN connection or DMZ hosted web servers. The end users authenticate with the Application proxy and all traffic goes through it. Enable Application Proxy and configure the connector. Publish applications – use the quick and easy wizard to get your on-premises apps published and accessible remotely. Azure Active Directory Graph API provides programmatic access to Azure AD to perform queries and create, read, update, and delete (CRUD) operations on directory data and objects. Redis cache managed by Microsoft and accessible from any application within Azure. Basic – Single node, multiple sizes, ideal for development/test and non-critical workloads. The basic tier has no SLA. 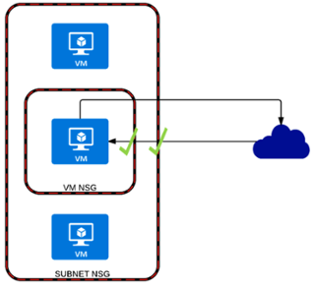 Standard – A replicated cache in a two-node primary/secondary configuration managed by Microsoft, with a high-availability SLA. Premium – All of the Standard tier features, better performance over Basic and Standard-tier caches, bigger max size (530GB), Redis Cluster to give a high-availability SLA, Redis persistence snapshots and back up to provide disaster recovery, and supports VNet’s to give enhanced security. Basic and Standard caches are available in sizes up to 53 GB, and Premium caches are available in sizes up to 530 GB with more on request. Two-step verification is a method of authentication that requires more than one verification method and adds a critical second layer of security to user sign-ins and transactions. or, costs via per-user consumption or per-authentication consumption based. Supports traditional one-way messaging, request/response messaging, and peer-to-peer messaging. Producers (senders) and consumers (receivers) do not have to be online at the same time. Stores messages in a queue until the consuming party is ready to receive them. Core components are queues, topics, and subscriptions. A ‘namespace’ is a scoping container for all messaging components. Multiple queues and topics can reside within a single namespace, and namespaces often serve as application containers. Storage queues, which are part of the Azure storage infrastructure, feature a simple REST-based Get/Put/Peek interface, providing reliable, persistent messaging within and between services. 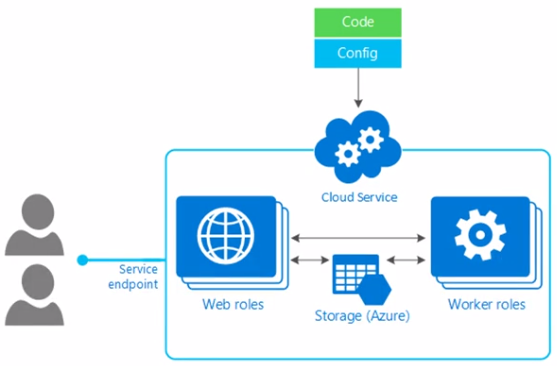 Storage Queues are like the Azure Service Bus, but Storage queues were introduced first, as a dedicated queue storage mechanism built on top of Azure Storage services. Service Bus queues were built on top of the broader “messaging” infrastructure designed to be far more integrated. When the code has finished its task with the message, it deletes the message from the queue with the DeleteMessage command. Maximum message size 64 KB, Maximum queue size 500TB. Your application must store over 80 GB of messages in a queue, where the messages have a lifetime shorter than 7 days. You require server-side logs of all the transactions executed against your queues. ‘Azure Disk Encryption’ is a different encryption service that only encrypts the virtual disks used by VM’s. For Windows VM’s uses BitLocker, for Linux VM’s uses DM-Crypt. Keys are kept in the ‘Azure Key Vault’. Azure Rights Management (RMS) Is a service that encrypts sensitive files and data, and provides ways to access that encrypted data for authorised and authenticated users. It is not an Azure specific service, it is used across O365, mobile devices, Windows file servers, AD, Exchange and SharePoint servers. Reader can view existing Azure resources. A standard storage performance tier which allows you to store Tables, Queues, Files, Blobs and Azure virtual machine disks. Maximum total request rate of 20,000 IOPS. A premium storage performance tier which currently only supports Azure virtual machine disks. Maximum total throughput rate of 50 Gbps. A Hot access tier which indicates that the objects in the storage account will be more frequently accessed. This allows you to store data at a lower access cost. A Cool access tier which indicates that the objects in the storage account will be less frequently accessed. This allows you to store data at a lower data storage cost. Page blobs are a collection of 512-byte pages optimised for random read and write operations. Option of ‘Premium Storage’ by providing SSD-based storage with provisioned IOPS and low latency. 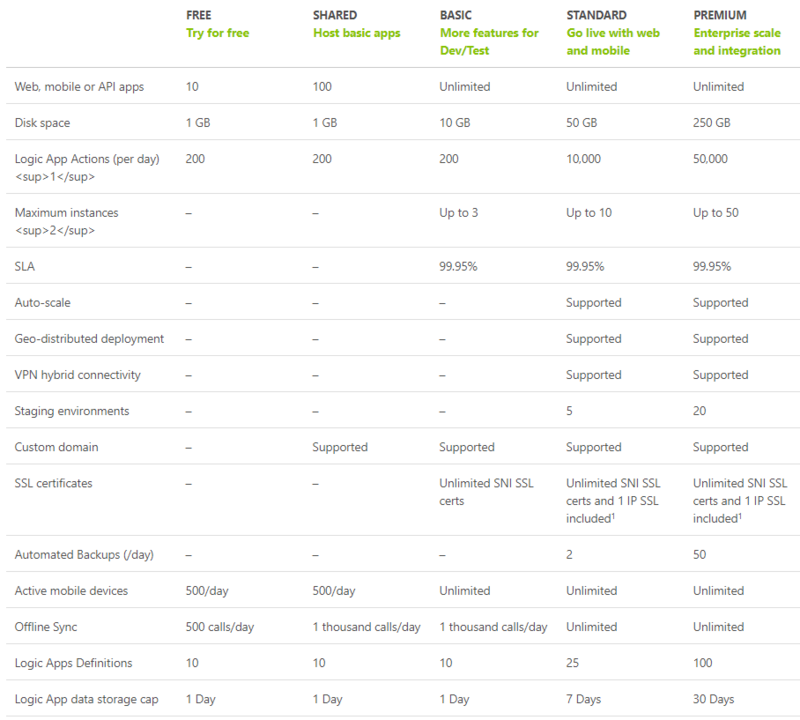 Pricing is based on a flat monthly fee, regardless of the actual amount of storage that is consumed. Subject to the limits of the Azure Storage account, which is 500TB limit on all storage types. Offered as LRS or GRS redundancy. Zone redundant storage (ZRS) – stores three copies of data across multiple data centres throughout a region but is only applicable to object storage with block blobs. Geographically redundant storage (GRS) – distributes 6 copies of data, 3 copies in 1 region and 3 copies in a 2nd region. This option protects against natural disaster scenarios that can affect a whole region. Geographically redundant storage with read access (RA-GRS) – is a modification of GRS in that users have immediate read access to redundant copies in case of a disaster. When you create a new storage account, Read-access geo-redundant storage (RA-GRS) is the default. You can use the AzCopy command-line utility to copy blob, file, and table data within your storage account or between storage accounts. The Azure Import/Export service provides a way to import blob data into or export blob data from your storage account via a hard drive disk mailed to the Azure data centre. The way you access a storage account is the same inside Azure as outside. 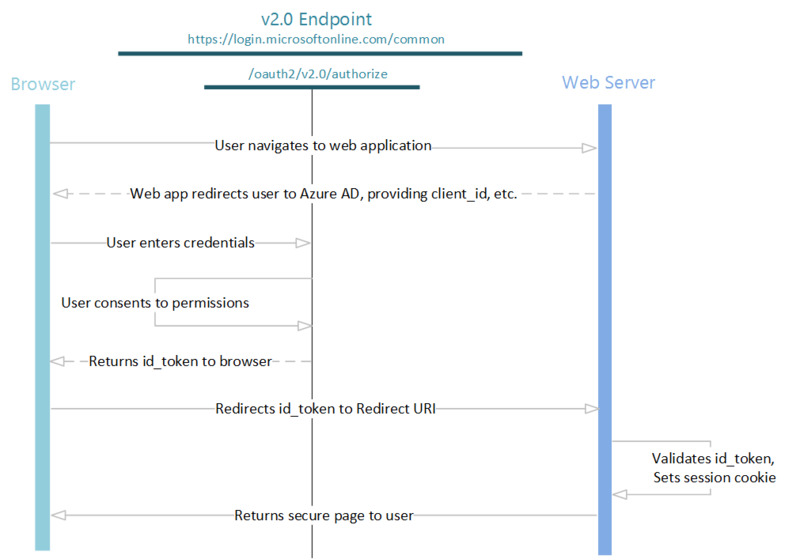 Your applications connect to the Azure storage account using a public endpoint. Storage account keys – Your storage account includes both a primary and secondary access key, both of which grant full administrative access to your account, and all resources within it. Exposing either of these keys opens your account to the possibility of malicious or negligent use. Azure SQL Database is a relational database-as-a service (DBaaS) using the Microsoft SQL Server Engine. Maximum database size on the Premium tier is 4 TB. SQL Database offers four service tiers to support lightweight to heavyweight database workloads: Basic, Standard, Premium, and Premium RS. You can adjust performance without downtime. Premium RS tier supports same large database sizes and IOPS of Premium tier, but with Reduced Storage copies so it’s far cheaper. Database performance is measured in DTU’s (Database Transaction Units) which are made up of blended measure of CPU, memory, I/O (data and transaction log I/O). Elastic databases – your database automatically scales up and down to meet demand, allowing you to use pools of storage that are charged by the hour. With elastic pools, you don’t need to focus on dialling database performance up and down as demand for resources fluctuates. Automatic backups: SQL Database automatically performs full, differential, and transaction log backups. Point-in-time restores: SQL Database supports recovery to any point in time within the automatic backup retention period. 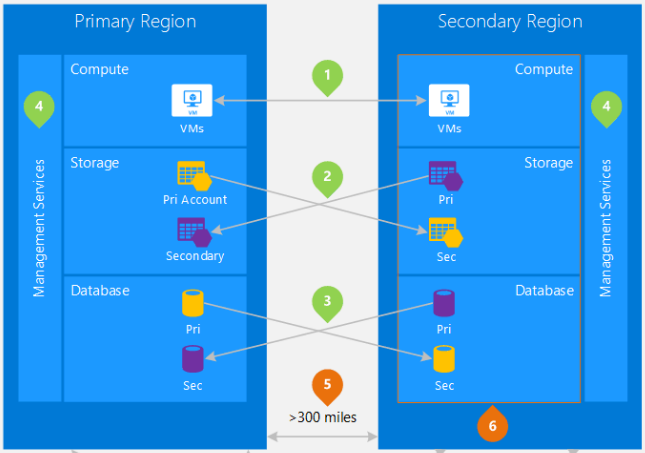 Active geo-replication: SQL Database allows you to configure up to four readable secondary databases in either the same or globally distributed Azure data centres. Failover groups: SQL Database allows you to enable geo-replication and failover. SQL Database dynamic data masking limits sensitive data exposure by masking it to non-privileged users. Database Sharding – Divide the database into horizontal partitions or shards. Each shard has the same schema, but holds its own distinct subset of the data. Sharding can improve scalability when storing and accessing large volumes of data. 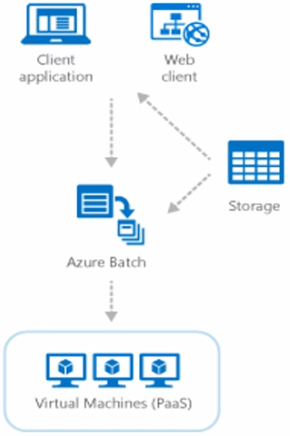 Azure SQL Data Warehouse is a massively parallel processing (MPP) cloud-based, scale-out, relational database capable of processing massive volumes of data. Combines the SQL Server relational database with Azure cloud scale-out capabilities. Enables increasing, decreasing, pausing, or resuming compute. Integrates across the Azure platform. Utilizes SQL Server Transact-SQL (T-SQL) and tools. Complies with various legal and business security requirements such as SOC and ISO. It’s performance is measured in DWU’s which measure underlying resources like CPU, memory, IOPS, which are allocated to your SQL Data Warehouse. Largest document size is 2MB. Now as of May 2017 is part of Azure Cosmos DB which as many more features like supporting additional API’s like MongoDB, Graph and Table. These VM’s allow access to the super-fast RDMA network on their 2nd NIC which is under 3ms latency and 32 Gbps throughput. Scheduler creates, maintains, and invokes scheduled work. Scheduler does not host any workloads or run any code. 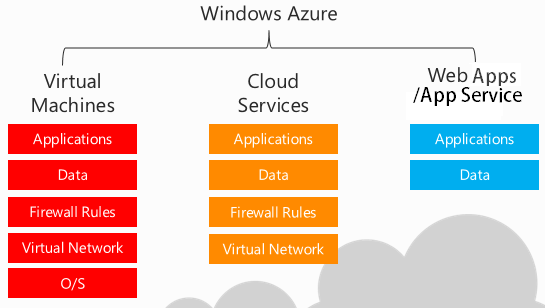 It only invokes code hosted elsewhere—in Azure, on-premises, or with another provider. It invokes via HTTP, HTTPS, a storage queue, a service bus queue, or a service bus topic. Azure WebJobs (part of the Web Apps feature in Azure App Service) and other Azure scheduling capabilities use Scheduler in the background. Machine learning is a technique of data science that helps computers learn from large sets of existing data to forecast future behaviours, outcomes, and trends. 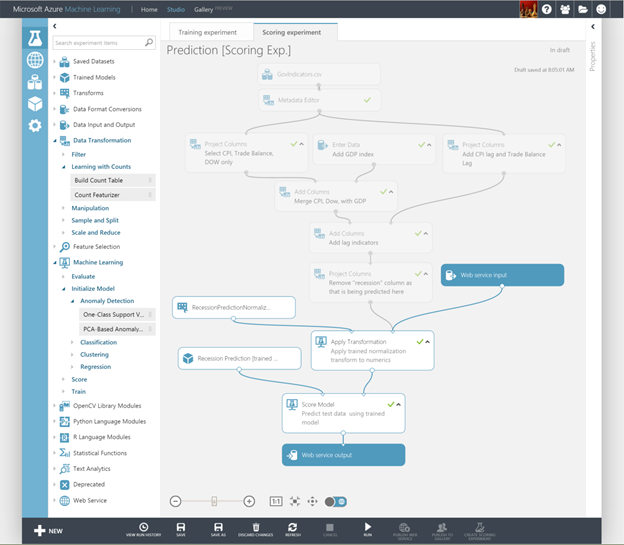 The Machine Learning Studio, you can quickly create predictive models by dragging, dropping, and connecting modules. The default backup policy is Daily backups at 8am and retention for 30 days. Can do VM level restores or file level restores. Overall limit of 500TB in an Azure storage account which the Recovery services vault sits in. An Azure region is an area within a geography containing one or more datacentres. Azure recommends that you replicate workloads across regional pairs to benefit from Azure’s isolation and availability policies. No. 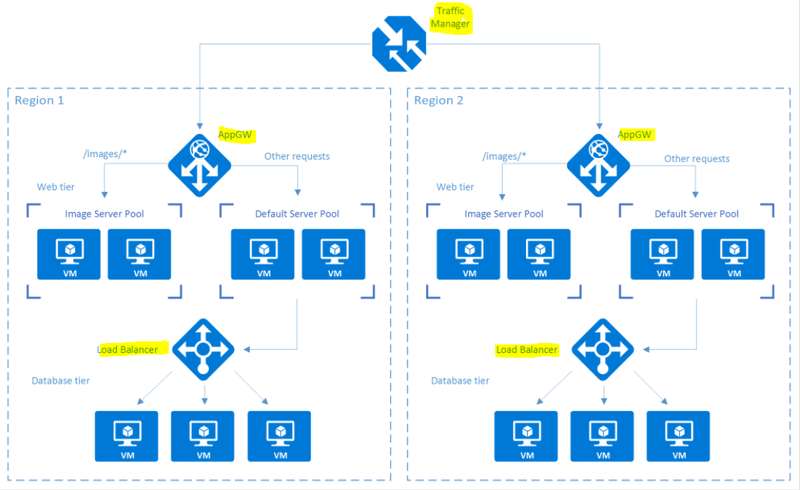 3 below is Azure SQL Standard Geo-Replication, you can configure asynchronous replication of transactions to a paired region. No. 5 above at least 300 miles of separation between datacentres in a regional pair. 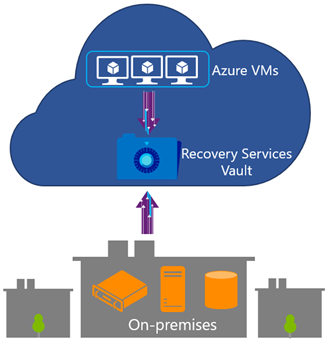 Automates recovery of an on-prem datacentre using Hyper-V, VMware or physical servers to Azure. You can run test failovers to support disaster recovery drills, without affecting production environments and the ongoing replication. You can run planned failovers for expected outages with zero-data loss, or unplanned failovers with minimal data loss (depending on replication frequency) for unexpected disasters. You can create recovery plans for sequenced failover and recovery of multi-tiered apps. Offers rich detection and diagnostics for issues at the application layer of your service. This is about YOUR code and how well it runs. AppInsights is well-integrated on top of data from Azure Monitoring but can also be used to track desktop and web applications deployed anywhere! You can push custom data from other services to it. If your solution is already deployed in Azure AppService, you can enable AppInsights from the applications settings without the need to reconfigure or redeploy your code. App Insights is not free, there are Basic and Enterprise tiers and you pay per node and data stored. 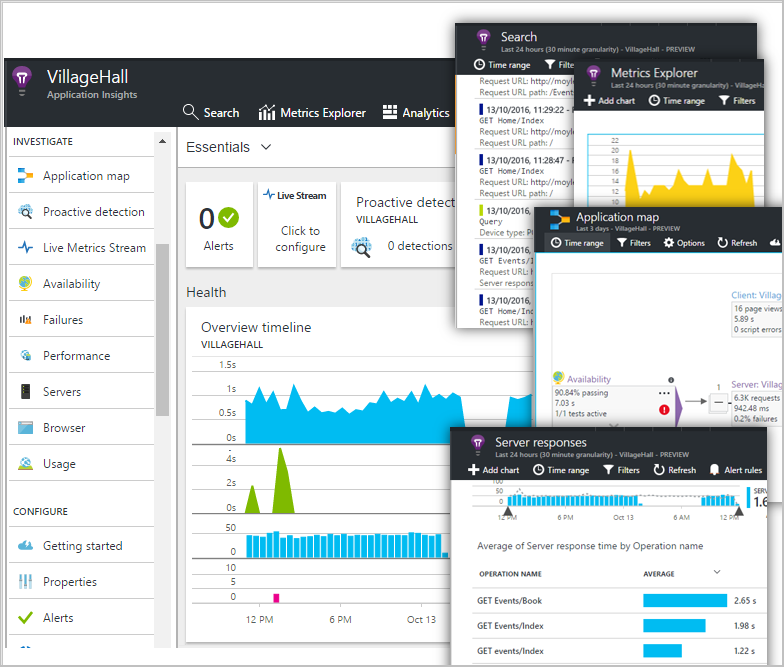 Monitoring the health of your infrastructure and availability, you now can monitor Azure activity and diagnostic logs and create automation tasks as a response to a specific rule. Azure monitor is built into Azure and is free. 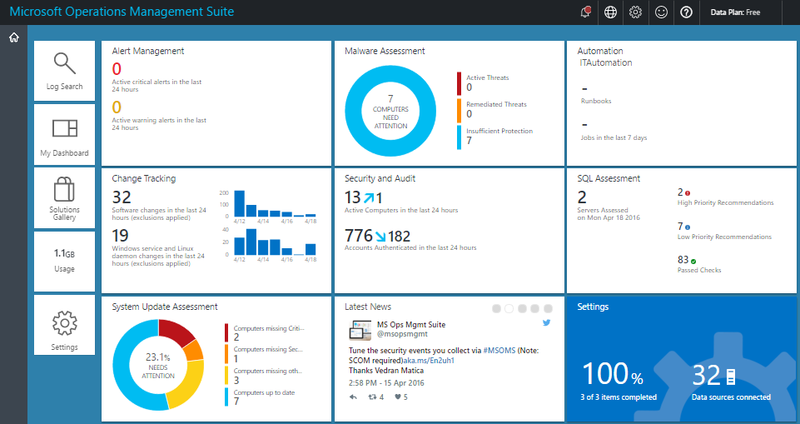 OMS sits at the highest level on Azure in terms of monitoring. “The one dashboard to rule them all”, OMS can be used to monitor and manage infrastructure on Azure, on-premises and third-party cloud-based infrastructure (AWS and Google Cloud). Azure Monitor and Application Insights data can be routed directly to Log Analytics so you can see metrics and logs for your entire environment in one place. OMS is the accumulation of a number of services and operations previously run as separate products, like the Active Directory Health service (RAP) along with Azure Monitor and Application Insights all wrapped in one. Azure Monitor and Application Insights can feed high level data to OMS to allow operations teams to have a quick check on the health of all monitored applications. OMS is not free and you pay for it per VM/node or there are a couple of packages available, E1 and E2. enable logging on the VM’s to a storage account, and make OMS read from that storage account. To make it work with Azure, you need to install the ‘Azure Management Pack for Operations Manager’ This pack allows monitoring of Azure PaaS services like SQL Database and Azure Web Apps. Other services on Azure where you can RDP in and install software like Cloud Services and Virtual Machines you install a SCOM agent. System Center Global Service Monitor part of SCOM is a cloud service that provides a simplified way to monitor the availability of external-web-based applications from multiple locations around the world. Importantly, Global Service Monitor monitors applications from the perspective of the customers who use them. E.g. how long is my site taking to load in London? Azure Functions lets you develop serverless applications on Microsoft Azure. Code your functions right in the portal or set up continuous integration and deploy your code through GitHub, Visual Studio Team Services, or other supported development tools. 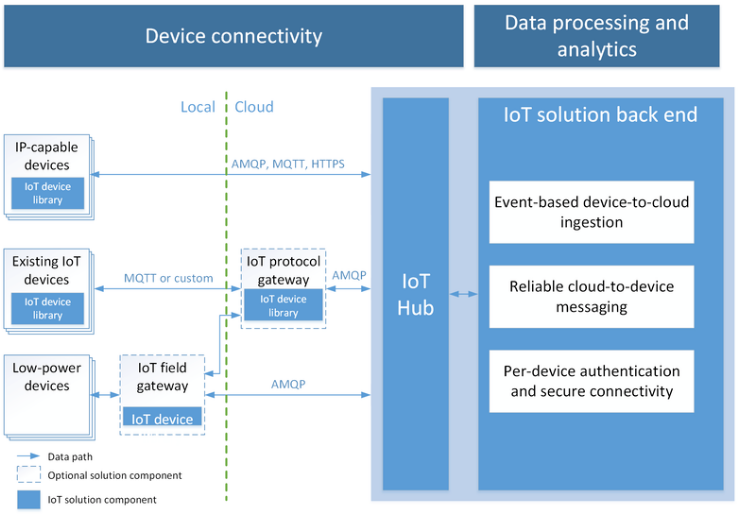 Azure IoT Hub is a fully managed service that enables reliable and secure bidirectional communications between millions of IoT (Internet of Things) devices and a solution back end. IoT hub allows file uploads, whilst the Event Hub doesn’t. 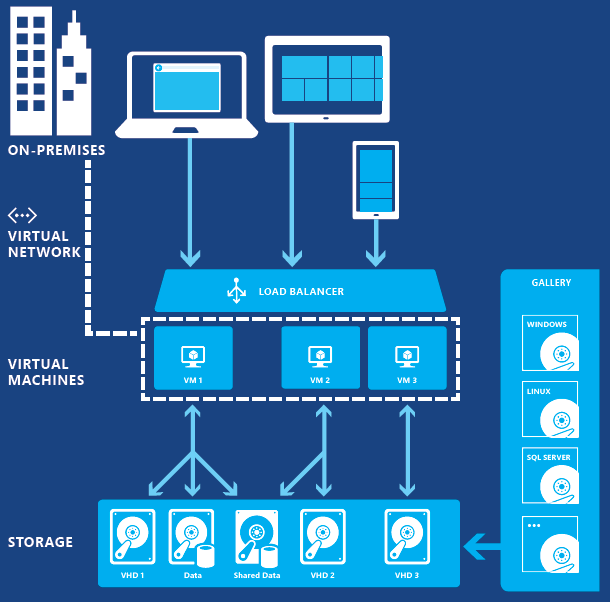 Azure Notification Hubs provide an easy-to-use, multi-mobile platform, scaled-out push engine. You can easily send targeted and personalized push notifications to any mobile platform from any cloud or on-premises backend. E.g. Send breaking news notifications to millions with low latency. To send a notification to all customers across the iOS, Android, and Windows phone versions of an app, the developer must work with APNS (Apple Push Notification Service), FCM (Firebase Cloud Messaging), and WNS (Windows Notification Service), while batching the sends. 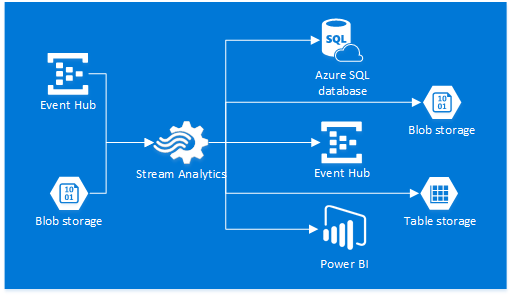 Azure Stream Analytics is a fully managed, cost effective real-time event processing engine that helps to unlock deep insights from live data. Simular to AWS Kinesis Streams. Stream Analytics makes it easy to set up real-time analytic computations on data streaming from devices, sensors, web sites, social media, applications, infrastructure systems, and more. Monitors and analyses streaming data instead of data stationary sitting on a database. API Management helps organizations publish APIs to external, partner and internal developers to unlock the potential of their data and services. Each API represents a set of operations available to developers. 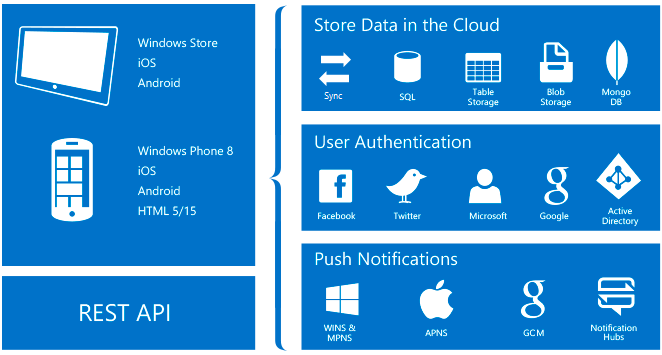 The target API apps can be hosted outside of Azure, on your own premises or even within AWS, ANYWHERE. Rate limit, quotas, and IP restriction policies can also be implemented at the API or individual operation level. API Management is offered in three tiers: Developer, Standard and Premium. API management service supports JSON Web Token (JWT) validation. JSON Web Token (JWT) is an open standard that defines a compact and self-contained way for securely transmitting information between parties as a JSON object.